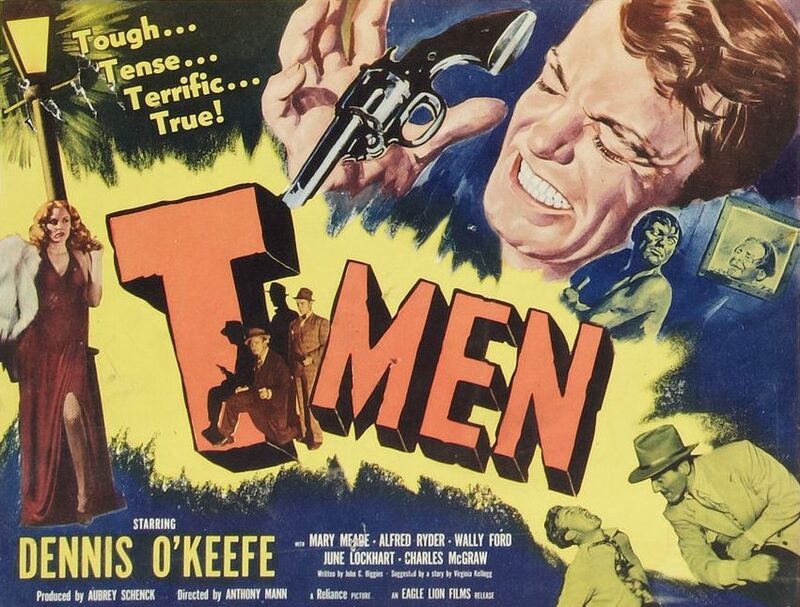 Anthony Mann’s T-Men sneaks up on you like a sap-wielding mug in a dark alley. For the first 10 minutes or so, it seems like just another docudrama about the heroic exploits of undercover government agents — like Henry Hathaway’s films The House on 92nd Street (1945) and 13 Rue Madeleine (1947) — right down to the stentorian voice-over narration by Reed Hadley, the guy who always did the stentorian narration in patriotic docudramas. Irey goes on to say that what we’re about to see is called “The Shanghai Paper Case,” a composite of actual counterfeiting cases tackled by the Treasury Department. Over the course of the first couple of reels, however, it becomes clear that T-Men is a very different film from The House on 92nd Street, and that its dry, fact-filled introduction is only the tip of the iceberg. Although Reed Hadley’s hokey narration occasionally dominates the proceedings, the script is tight and the actors are all excellent. Dennis O’Keefe and Alfred Ryder, who play undercover treasury agents Dennis O’Brien and Tony Genaro, are solidly believable, and Wallace Ford — who plays “The Schemer” — is always fun to watch, but for my money, the most memorable character in the film is “Moxie,” played by the granite-jawed Charles McGraw. Moxie is a merciless thug who shoots men dead without blinking, breaks fingers as easily as he asks questions, and boils a man to death in a steam bath without changing his expression. But it’s not just the sudden, brutal acts of violence or the sense of paranoia that suffuses T-Men that set it apart from other films of its ilk, it’s also the dimly lit, “you are there” cinematography by John Alton. T-Men was Mann’s first collaboration with Alton, but it wouldn’t be his last. Together they would go on to make Raw Deal (1948), He Walked by Night (1948) (which Alfred Werker directed and Mann co-directed), Reign of Terror (1949), Border Incident (1949), and Devil’s Doorway (1950). 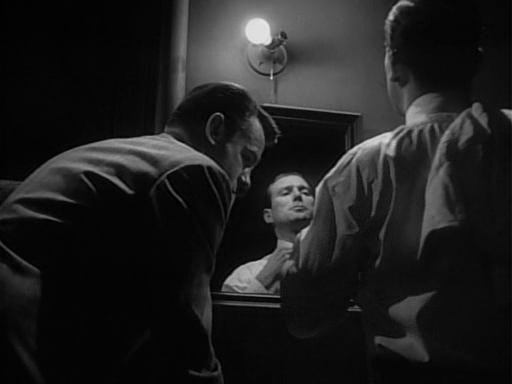 Alton and Mann’s contribution to what we now call “film noir” is enormous. T-Men is a great picture. It’s tense, violent, and looks amazing. Despite its low budget, it was a big hit when it was released, and it’s still fresh today. *And cribbed by yours truly from Alan K. Rode’s fantastic book Charles McGraw: Biography of a Film Noir Tough Guy. Posted in 1947, December 1947 and tagged Alfred Ryder, Anthony Mann, Charles McGraw, Dennis O'Keefe, Eagle-Lion Films, Film Noir, John Alton, Wallace Ford. Bookmark the permalink.